Add a Second Hard Drive (drive size up to 9.5mm in height) to your laptop using your laptop's optical drive bay. Add it as a second hard drive in the laptop in lieu of a SATA Optical drive. This device/caddy will fit in a "standard 9.5mm-high" SATA optical DVD drive bay found in laptop computers. Please note that this will fit in notebooks with a SATA Optical Drive Bay. 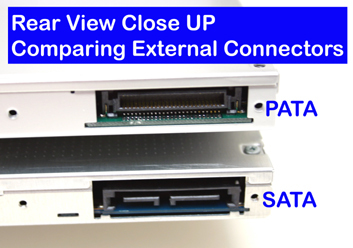 See photos below comparing the external interfaces of the OBHD caddies. Simply pull out your optical DVD drive and replace it with our OBHD Optical Bay Hard Drive caddy. This caddy is designed for you to transfer your optical drive bezel faceplate to the caddy. The kit also includes a universal faceplate to attach to your optical drive (shown in photo). The base of the caddy is manufactured in light-weight die-cast aluminum to dissipate heat from the drive and to help reduce EMI noise making it perfect for high-performance applications.